Self contained cottage located on a 12 acre Alpaca Farm on the outskirts of Manapouri township along the Southern Scenic Route. Stunning mountain views take in the Kepler, Hunter, Takitimu and Eyre Mountains and their changing moods. 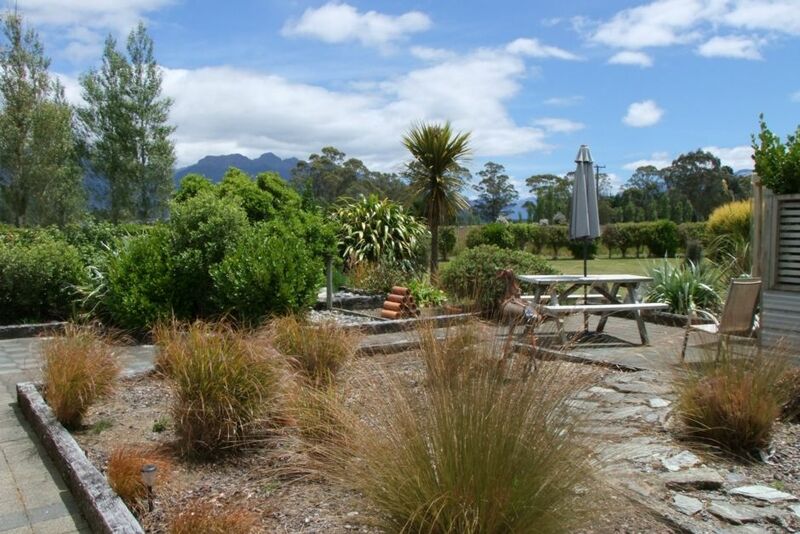 Kepler Mountain View Cottage has its own outdoor living area surrounded by gardens. Facing north looking at the Kepler Mountains the cottage attracts all day sun and is a home away from home and great place to either base yourself while exploring Fiordland or just sit back relax and take in the views. You are invited to join in hand feeding the alpacas each evening and there is always alpacas to engage with and chat with over the fence at your leisure. For guests comfort in the winter the Queen bed has a luxury alpaca duvet for ultimate climate control. Heating and cooling is by way of an inverter heat pump. Great place to base yourself when visiting Doubtful or Milford Sounds, exploring Fiordlands many attraction, tramping or just relaxing. Ideal for either overnighting or when you want to spend a little time exploring and unpack those suitcases and get your gear washed and resorted. We can store your vehicle and gear while cruising overnighting or away tramping. Kepler Mountain View Alpaca Cottage has an outdoor living area and gardens along with a gas BBQ and outdoor furniture to enjoy leisurely summer evenings. Gas hot water ensures that you have ample hot water all the time. Water supply is pure Fiordland rainwater - no chemical treatments needed. The bedroom has Queen bed and and overlooks the gardens and Kepler Mountains. The cottage is cleaned upon your departure by our professional cleaner, all you need to do is leave it tidy, pop the last dishes in the dishwasher and be off and enjoy your holiday. Kepler Mountain View has stunning views surrounded by mountains in all directions. When we stood on this plot of bare land back in 1999 it was a 5 minute decision that this was a really special place where we would want to live eventually. We were going to retire to this property (we lived 160kms away in Invercargill at the time and used to come up hiking in Fiordland most weekends), the property drew us to move there well before retirement and integrate this stunning part of New Zealand into our everyday lives and we have never regretted our move to this property. Amazing views that change every day with different moods of the mountains and skys. Set on our 12 acre alpaca farm the cottage has outstanding rural and mountain views and overlooks its own gardens. Meet the alpacas and hand feed them and enjoy their quirky natures. Tea, (including herbal), coffee (instant and coffee beans with grinder and plunger), sugar, salt & pepper, spices, oil, vinegars, flour, cornflour. The cottage was ideal for our needs. It had everything we needed, was in a great location. Jessie offered helpful advice about overnight cruises on Doubtful Sound as well as other things to do in Manapouri and TecAnau. It was lovely to learn a little about Alpacas from Jessie and Ray who were naturally enthusiastic about them and admire Jessie’s creativity in making lovely clothing from the wool. Thoroughly recommended. This is a lovely spot, relaxing and pretty. The only reason I gave it 4stars was that the internet didn't work. The property was very comfortable and offered everything we needed. The property was very comfortable and offered everything we needed. Its self contained with lots of privacy but the owners are around to offer any advice needed. A good restaurant is a couple of minutes drive away and the start of our day at doubtful sound the same distance. Brilliant all round. The cottage, facilities, location and views of the Kepler Mountains all matched the pictures and description on Bookabatch website. We especially enjoyed the quiet rural location, garden outlook from north facing windows, with mountain ranges beyond and proximity to all that the Manapouri/Te Anau area has to see and do. Manapouri Village is located in the heart of Fiordland National Park on the edge of Lake Manapouri and the stepping off point for trips to Doubtful Sound or enjoy New Zealands most beautiful scenic lake - Lake Manapouri. This area is at the heart of conservation. A peaceful natural surrounding in which you can be as busy or as laid back as you choose.